I've been mixing old jewelry with cast off belt buckles. I'm still thinking ahead to my spring wardrobe. 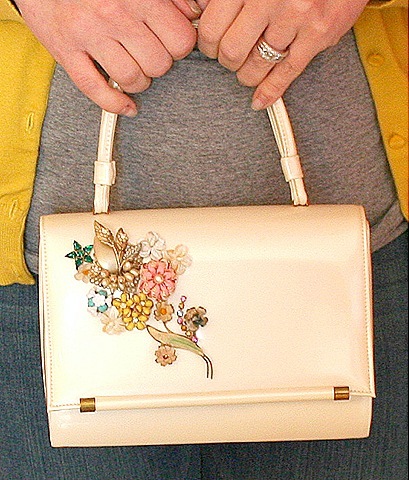 Old jewelry can take a cute old patent leather purse to fabulous. Love them! 🙂 I used to carry vintage bags like that around a lot. Very pretty, another craft idea to my list. That handbag is gorgeous with your creative touch. Loving the handbag! And I’m a sucka for bling belt buckles! Wow!!! I love each piece. GREAT job and it sets the heart soring with inspiration. I would love one of those lovely treasures for my own..
WOW! Love that purse! You are so talented!! That purse makeover is amazing. You’re good! They all look terrific, and the purse is divine! Suzy, I love adding bling to a purse! It makes it unique. You have the best bling…I know…years of collecting. You really have a “way” with bling, Suzy! Strut your stuff, girlfriend. That is just too cute! 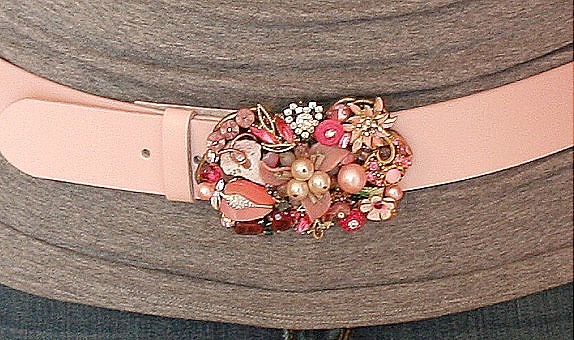 the belts are adorably yummy! Sorry I haven’t been by in awhile! Had to come see what new things you are up too! Love the cactus boots, i got 2 pair of boots while we lived in texas, one pair are pink ostrich hot and light pink , the other are black on the bottom cream on the top with bronc riders in black on the tops. They can become quite the addiction, my mom used to go up to the justin outlet whenever she could LOL. Have a great day and stay warm. That purse is the bee’s knees! I have been doing some layering of junky bling for spring brooches. My mom would say they’re gaudy…but I LOVE them. Happy Spring! 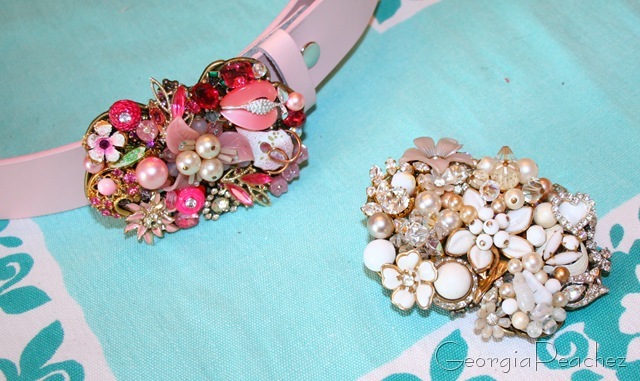 these are gorgeous though the idea of doing that to my old brooches gives me the willies. but you must have a much larger stash — would you mind taking a photo of it sometime? Those are so fun! I’m swooning over the belt buckles! OH!MY!GOODNESS! What you did to that purse! I am swooning! I picked up an orphaned pink vintage earring the other day simply because I knew you would like it, and everything you like is GREAT! YOU are the bling queen! It belongs in Vogue, my dear!! Those are wonderful ideas for antique jewelry. I love collecting old brooches and have a large collection of clip earrings that I do not wear much any more. My wheels are turning now. 🙂 Another thing I like to do too, is in the summer use a long piece of beautiful lace and make a belt out of it and put either a pretty flower or brooch in the front. I am glad I found your blog through OWOH. I am going to add your link to my list of links so I can continue visiting you. 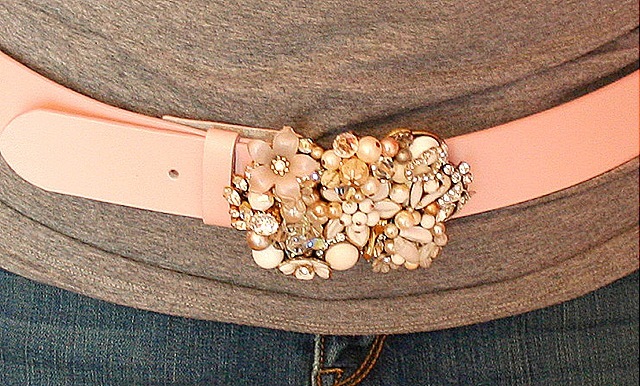 How do you attach your bling to the purses and belt buckles? I have been using E-6000 to make some collage jewelry. Do you use glue on the purses? Oh my, that’s one lovely purse. I can’t believe it’s made from scratches. I also have lots of old jewelry in my house and I don’t know what to do with them. Now I have an idea. Thanks for sharing.